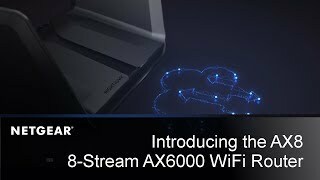 Technical Specifications WIFI TECHNOLOGY 802.11ax Dual Band WiFi (AX6000) 2.4GHz AX: 4x4 (Tx/Rx) 1024 QAM 20/40MHz, up to 1.2Gbps 5GHz AX: 8x8 (Tx/Rx) 1024 QAM 20/40/80/80+80MHz, up to 4.8Gbps Backwards compatible with 802.11a/b/g/n/ac WiFi WIFI PERFORMANCE AX6000 WiFi WIFI RANGE Very large homes WIFI BAND Simultaneous dual band 2.4 & 5GHz BEAMFORMING Beamforming+ — Boosts speed, reliability and range of WiFi Connections for 2.4 and 5GHz NUMBER OF ETHERNET PORTS Five (5) 10/100/1000 Mbps Gigabit Ethernet ports 1 WAN & 4 LAN Dual Gigabit Ethernet Port Aggregation 5G/2.5G/1G Multi-Gig Ethernet LAN port NUMBER OF USB PORTS Two (2) USB 3.0 ports PROCESSOR AX Optimized powerful 64bit quad-core 2.2GHz processor KEY FEATURES Powerful Wi-Fi 6 router with the next-gen AX WiFi - The New Standard of WiFi 12-Stream WiFi - Faster and more reliable network speeds to every connected device OFDMA —Improved capacity and efﬁciency 1024-QAM—25% data efﬁciency and faster speeds than a 256-QAM router SECURITY Latest WiFi Protected Access® (WPA3) Guest network access—separate & secure VPN Support—Secure access to your home network away from home Automatic ﬁrmware update delivers latest security patches to the router PHYSICAL SPECIFICATIONS Dimensions: 12.2 x 2.75 x 1.22 in (310 x 70 x 28.50 mm) Weight: 3 lbs (1364g) PACKAGE CONTENTS Nighthawk AX12/12-stream AX6000 WiFi Router Ethernet cable Quick start guide Power adapter SYSTEM REQUIREMENTS Microsoft® Windows 7, 8, 10, Vista®, XP®, 2000, Mac OS®, UNIX®, or Linux® Microsoft® Internet Explorer® 11 or higher, Microsoft Edge, Google Chrome™ 55 or higher, Firefox® 45 or higher, Safari® 10 or higher † Maximum wireless signal rate derived from IEEE 802.11 speciﬁcations. Actual data throughput and wireless coverage will vary and may be lowered by network and environmental conditions, including network trafﬁc volume and building construction. NETGEAR makes no representations or warranties about this product’s compatibility with future standards. ‡ MU-MIMO capability requires both router and client device to support MU-MIMO. § Requires compatible AX clients || Multi-Gig Internet speeds require compatible service plans and equipment.